Get LAN status from Menu Bar! ▸ Works with MacBook Air, MacBook Pro, iMac, MacBook, MacPro, Mac Mini. And also comparable with the external adopters via thunderbolt and C type ports. ▸ Support for Thunderbolt, Firewire and retina icons!!! See the status of your LAN/Ethernet connection right from the menu bar. This utility adds a neat icon on the menu bar which lets you know the status of the connection and other stats like your IP address, mac address, upload and download speed, data usage etc. 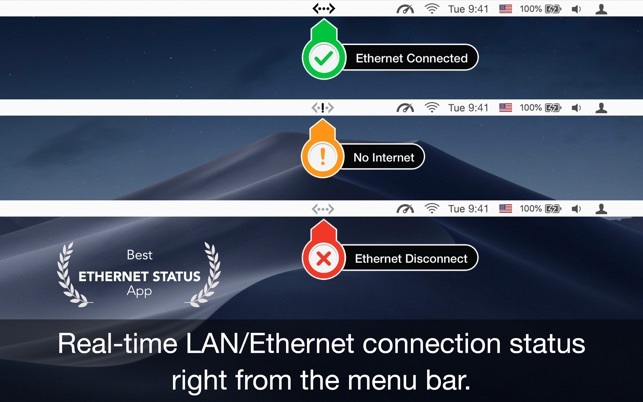 - App Very Helpful for Flaky Ethernet connection - by "UnionBeth"
- Perfect for troubleshooting - by "TalonNYC"
- Extremely useful - by "Brachy8"
- Does what it says - by "woolly101"
- Definitely works! - by "Nicol J Craig"
- Useful well-integrated App - by "Robotpanda2014"
- Brilliant app, does the job - by "Hybris2000"
- Very useful utility - by "hushpuppy56"
• Upload and Download speed for each adapter. Thanks for review and ratings. I have a MacBook Pro with USB-C connections and my ethernet connection is via a USB-C Dock that is a little persnickety. Having my LAN status in the status bar lets me know right away if need to reboot after I connect because the dock is being fussy. Shows internal and external IP addresses - including WiFi and Ethernet links - flawlessly. Extremely useful for troubleshooting when you need to know the public IP your ISP gave you as well as which connections are hosting which internal IP’s!